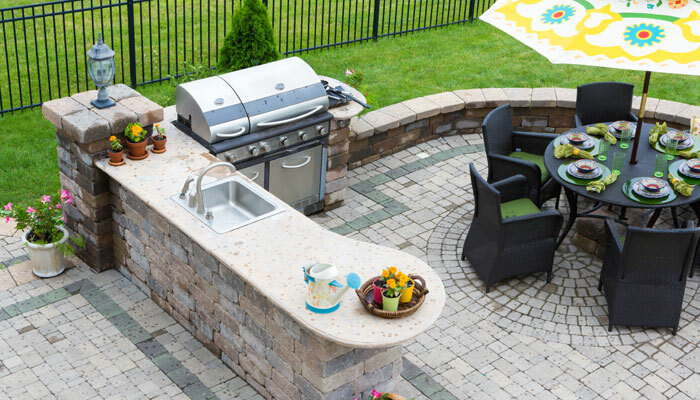 Maximize your out door entertaining space with a custom outdoor kitchen from Tyler’s landscaping. One of the most popular areas to renovate in the home is the kitchen. On average, most can see a return on investment (ROI) of as much as 70–80%. Seems like a pretty decent return, but what if you’ve been thinking about building an outdoor kitchen? Can you expect the same results? There are numerous variables to consider when planning a great outdoor kitchen. Obviously the first consideration is how it fits your lifestyle and what experiences you desire to have with this outdoor addition to your living space. How Big Do You Want Your Outdoor Kitchen to Be? Think about how your new space and lifestyle because it can impact how much money you’ll put into your outdoor kitchen. You should sit down and plan out your space with an expert. They can help you figure out the best plan that fits your needs and budget. What Kind of Materials Do You Plan to Use? Since this kitchen lives outdoors, you’ll want to use quality materials that can withstand any type of weather. The last thing you need is for it to fall to pieces in the next rainstorm because you skimped on materials. Don’t forget to ask about using recycled building materials or eco friendly materials in your design. It helps keep them out of landfills and might save you a little money. Once your budget established and what essential features you want, maybe you’ll have a little extra cash to play with. Think about items that might enhance your space: landscaping, gas grill, refrigerator, appliances, brick pizza oven, lighting or anything else you can think of. This is the time to splurge a little on the things you want. You certainly don’t need to have a large budget, but if you spend a little bit of extra money to get quality materials, you not only get an additional space at home to spend with your family, you also may add an extra room to your home. Plus, if you get all the bells and whistles with your outdoor kitchen, your real estate agent may be able to add it as an additional kitchen space to your listing which will increasing your home’s value and that return on investment. Outdoor kitchens can be a great investment opportunity for your home and not to mention they provide additional living space and an awesome place for your family or to host your next party. Before you jump on the outdoor kitchen bandwagon consider the points above, and if it makes sense for your home talk with us at Tyler’s Landscaping and we will help create a plan that fits your needs and budget. Click the link on our web page for a free estimate request or call us today at 815 636 8500 for your free outdoor living consultation.